Spanish exegete and moralist; born about 1110; father of Moses Maimonides. He studied under Joseph ibn Migash at Lucena, and became a dayyan. He was the author of a commentary, in Arabic, on the Pentateuch, fragments of which are quoted by his grandson Abraham. 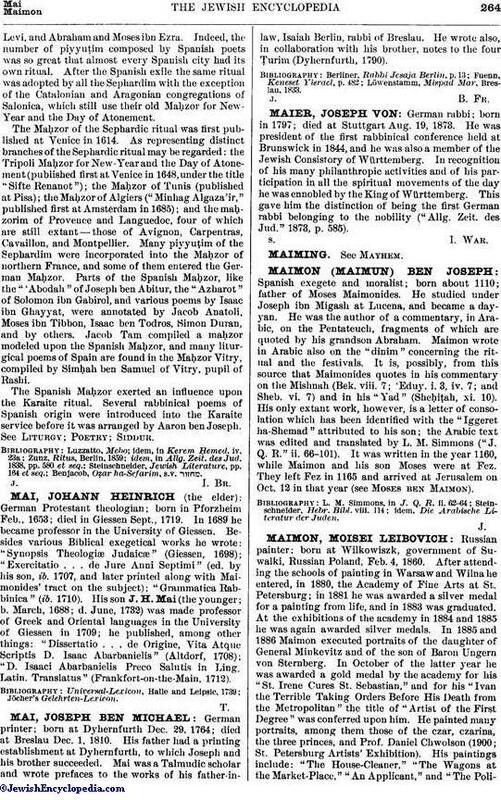 Maimon wrote in Arabic also on the "dinim" concerning the ritual and the festivals. It is, possibly, from this source that Maimonides quotes in his commentary on the Mishnah (Bek. viii. 7; 'Eduy. i. 3, iv. 7; and Sheb. vi. 7) and in his "Yad" (Sheḥiṭah, xi. 10). His only extant work, however, is a letter of consolation which has been identified with the "Iggeret ha-Shemad" attributed to his son; the Arabic text was edited and translated by L. M. Simmons ("J. Q. R." ii. 66-101). It was written in the year 1160, while Maimon and his son Moses were at Fez. They left Fez in 1165 and arrived at Jerusalem on Oct. 12 in that year (see Moses ben Maimon).